Quentin Tarantino’s Inglourious Basterds is pure bliss, the kind of cinematic magic that sends me out of the theater lightheaded and smiling, thinking all is right with the world. It’s intoxicating, running over 150 minutes, yet seeming to last barely more than 70. It’s bold, rambunctious, and energized from frame one, filled with nothing more than great filmmaking. It’s the rare type of film that’s so pitch perfect, so fully realized in every detail, that it lifted me into an incredibly good mood that has yet to wear off. Just typing these words, I’m getting so excited I need to take a deep breath. I need to see this movie again, not just to give added boost to my excitement, not to mention my good mood, but to get my head around it. This isn’t a movie that gently allows you to slowly comprehend. This is a movie that assaults you with entertainment, kicks you upside the head with pleasure, and sends you reeling out of the theater while begging for more. I haven’t been able to stop thinking about it. Tarantino has crafted an enormous yet intimate World War II action epic that brings his talents and obsessions into good use and tight control. He’s never been more in control over the elements of filmmaking. In his use of sound, color (those reds! ), and composition the film, at times, comes across like a sort of dream collaboration between Curtiz, Hitchcock, Godard and DePalma: Casablanca and Foreign Correspondent meets Made in U.S.A. and The Untouchables. But, for the first time since Jackie Brown, a Tarantino film is much more than the sum of its influences. This is a passionate film, full of beautifully rendered and lovingly detailed characters saying and doing memorable things. This is a patient film, allowing for long, sizzling and suspenseful dialogue passages. This is a perfect apotheosis of Tarantino’s filmmaking, a chance for him to, at long last, put cinema itself in the forefront (a film critic becomes a suave spy at one point! 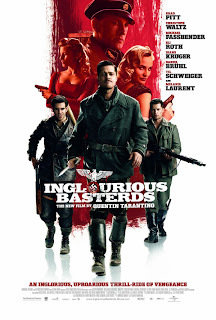 ), for Inglourious Basterds is, if nothing else, a grand love letter to an art form, a film where the transient yet permanent impact of film can be both a major theme and a major plot point, summed up beautifully with the shot showing a ghostly image of a face projected on a wall of smoke in a burning theater. Going in to the film, one can be accused of anticipating a pure blood-and-guts, men-on-a-mission exploitation film, given the marketing focused on the elite team of Jewish soldiers – nicknamed “the Basterds” – dropped behind enemy lines to put fear in the hearts of the Nazis. Even though the Basterds, led by Lt. Aldo Raine (Brad Pitt, in a great, charming, character-actor performance), do their fair share of scalping and bludgeoning in the film, the emotional heart comes from Soshanna (a radiant Mélanie Laurent), a Jewish teen who flees the massacre of her family to eventually become the owner of a movie theater. That theater becomes an important location for the fiery finale, but Soshanna provides an emotional link throughout the film. We follow her growth from a frightened teen to a confident young woman. We care about her and about the plan that she creates in the kind of deep way that only the greatest fictions allow. The link between Soshanna and the Basterds is the suave and sneaky Nazi detective Colonel Landa – nicknamed the “Jew Hunter” – who comes to us in a brilliant performance by Christoph Waltz, a middle-aged European actor who remains unknown on these shores. He’ll be unknown no longer. In a film filled with great performances, he’s the best. He’s quick witted, hilarious and menacing, delivering Tarantino’s dialogue with perfection. But Tarantino’s strong suit has always been unexpectedly perfect casting which leads to some wonderful performances. Here, he coaxes interesting performances out of such differing people as horror director Eli Roth, Diane Kruger (previously of Troy and National Treasure), and even Mike Myers. But to get back to Waltz, his Landa (a great character that I loved to hate) shows up in all of the five chapters that Tarantino has broken the film into. Each chapter has only a few scenes, each given a lengthy dialogue scene as its major set-piece. These dialogues – Glenn Kenny has clocked them at about fifteen to thirty minutes each – are tense, funny, suspenseful, riveting and thematically rich. They feature some of the best writing that Tarantino has ever produced, memorable and distinctive while furthering character and plot and, at the same time, allowing the scenes to rise and fall with a sense of natural realism. The dialogue is heightened without being too “Tarantino,” playfully teasing out echoes to films of the 40’s, Leone, and more. These scenes play out like perfectly crafted short stories (chapters, if you will). The dialogue comes in a multitude of languages, all subtitled, and flows with an easy musicality. Often suspense comes from which characters can understand which languages and there’s great fun to be had in following the shifting power structure within the conversations. Through all this talk, talk, talking, the anticipation of the ultimate execution of the main plot grows unimaginably high. There are short bursts of action within each chapter but not until the fifth chapter do all the plotlines – and surviving characters – converge upon a grandly orchestrated and perfectly executed set-piece of suspense and action shot through with humor both quintessentially Tarantino and Marxian (Groucho, Chico, and Harpo, not Karl). Even with all this subtitled dialogue, and subtle performances, and long scenes infrequently riddled with stylistic embellishments and fast-cut flashbacks (not to mention the score that borrows from Morricone and Bowie), this is the biggest crowd-pleaser I’ve seen in a long time. Every scene was received wonderfully by the audience with which I saw the film. It’s always fun to hear over one hundred people reacting to a film in the same way that you are. We all stared up at the screen and laughed, gasped, screamed and squirmed together. Tarantino knows that an audience – an ideal audience – can be trusted to follow complex lines of questioning and long-winded monologues, to laugh at subtlety and jump on command. Is his film manipulative? You bet. But it’s just as much fun as when Hitchcock famously said he loved playing an audience like a piano. When manipulated by an expert filmmaker, one who’s pushing perfectly crafted buttons, who cares if it’s manipulative? In its unstoppable pacing and relentlessly entertaining style and craft, Inglourious Basterds reminded me of Raiders of the Lost Ark. Together, they are two World War II movies, in touch with their filmic lineage, that cheerfully warp historical reality in order to go for the jugular. They are unafraid to entertain, and unafraid to get the crowd stirred up and energized by the sight of Nazis getting beat up, shot up, and melted. (Both of them pull from the long tradition of Nazis as villains in pulp fiction including The Dirty Dozen, wherein partying Nazis find themselves torched).They are both the works of filmmakers in total control and using that control to create total perfection in the realm of pure entertainment. That comparison also brings me to the common criticism of the film that has been heating around the Internet in the days leading up to the film’s release but seems to have cooled some now. Some have said that the movie’s brutality is amoral in the ferocity with which the Basterds treat the Nazis and in this film’s equivalent of the Raiders Nazi meltdown. That’s not an unexpected criticism, especially given the bloodlust bent of the advertising, but it’s completely unfounded by the film itself. The movie is much tamer than you’d expect, especially if you’ve seen the Kill Bill movies or Death Proof (I say that not as a criticism of the violence in those films, but as a means of comparison). Sure, it has its occasional violent moments, and they do earn the film its R-rating, but they don’t exploit World War II itself, nor do they create an irrational hatred of Nazism. The sense of revenge is well-justified, both within and outside the world it creates. The movie is made up of earned suspense that builds to quick, restrained, flashes of violence. It also contains a built in rebuke, in its final, and most violent, chapter, to audience members who will get a kick out violence for violence’s own sake. (There are spoilers through the end of the paragraph). The characters are sitting in the theater watching a German propaganda film in which a sniper is killing dozens of Allied soldiers. The Nazis go wild, cheering with a ferocity that’s as frightening as it is morbidly comedic. Then Tarantino allows the Basterds’ and Soshanna’s plans to go into simultaneous effect, pulling a sick joke on the characters who had just been enjoying the massacre on screen by making them the recipients of one. This has long been Tarantino’s unsung gift, to at once rebuke and relish screen violence, and he uses it elsewhere in the film, as well, such as a scene where, preceding a Nazi bludgeoning, Aldo Raine tells the doomed man that it is “the closest thing we [the Basterds] have to going to the movies.” (That it’s Eli Roth doing the bludgeoning adds another tricky layer to the moment). There’s so much to discuss with Inglourious Basterds, so much excitement attached to the way my synapses can’t stop firing with thoughts and memories of the film. I desperately need to see this again. In fact, I should stop typing what has become the longest review I’ve written for the blog thus far, and just go see it right now. It’s the best, most interesting, most entertaining film of 2009 so far, a film well worth discussing and dissecting. At the very end of the film, a character smirks into the camera and says “this might just be my masterpiece.” It’d be a cocky flourish of a finish to the film if it weren’t totally earned. Nothing inspires maudlin cliché as feverishly as the romantic comedy, but director Marc Webb, in his debut film, working from a screenplay by Scott Neustadter and Michael H. Weber, makes (500) Days of Summer a compulsively enjoyable, exceedingly clever, and all-around refreshing movie, a pure summer breeze of fun and whimsy. It stars indie darlings Joseph Gordon-Levitt and Zooey Deschanel as the nice young couple (Tom and Summer) who fall in and out of love through the course of a jumbled chronology. At the outset, the narrator politely intones a warning that “this is not a love story.” But of course it is, despite being a deconstructionist genre scramble. It could have gone so wrong, veering easily into precious or precocious territory, but it never does. The movie is sweet and charming in tone and construction, even though it feels a little empty at times. It’s touching without hitting hard with emotion, but it’s dazzling all the same. Only in the days following my viewing did I find the movie ingratiating and memorable, more than just a nifty trick. This isn’t just a clever rom-com that is nonetheless repeating well-worn paths. This is a film with a unique point of view, told persuasively from a male perspective. The audience is firmly placed in Tom’s head. Nothing we see is outside of Tom’s take on the events. Summer remains an enigma. We don’t always know her motivation; we remain unaware of her true feelings. The film gives us a purely subjective experience and it’s both exhilarating and exasperating. Levitt and Deschanel do a fine job inhabiting characters that are at once characters and archetypes, products both of imagination and intellectualization on the part of the screenwriters. They know the rules of the rom-com so thoroughly that they can tweak them or cast them aside at any given moment. The movie’s plot is scrambled but, oddly, I find myself remembering the events in roughly chronological order. The flow of the piece is natural, placing scenes of thematic or emotional coherence against one another. We see a scene towards the end of the relationship set in an Ikea, followed immediately by a scene from early in the relationship which is also set in Ikea. 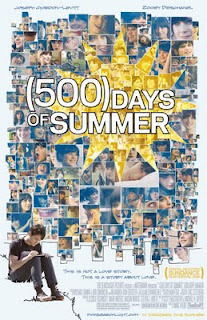 We see a montage early in the film where Tom describes all the little things he loves about Summer. Later, we will see the exact same images in the exact same order, only this time the little things are driving him crazy. Webb spins all kinds of delightful webs with the visual wit of his mise-en-scéne, throwing all kinds of tricks and embellishments into getting at the film’s emotional center: dance numbers, animation, and split screens (once with the left labeled “expectations” and the other “reality” start as duplicates and slowly drift apart) are all used to splendid effect. The pain and swooning of this man’s emotions are vivid and genuine. The movie’s not exactly groundbreaking – and can’t touch the meta-textual loop-de-loops, not to mention the humorous and emotional wallop of, say, Annie Hall – and yet, for all of its sense of being nothing more than a cleverly told series of anecdotes, it’s incredibly entertaining, continually driven forward by its sheer momentum, carried along by its fine soundtrack. (500) Days of Summer is as effortlessly enjoyable as a well-crafted pop song, in the repetition and rhythm of themes, moods, feelings, and locations that build into a cleverly satisfying portrait of a relationship gone wrong. With Funny People, his third film as director, Judd Apatow, the most prolific peddler of the modern R-rated comedy, has brought more ambition and less restraint, creating the type of generously textured, yet also turbulently messy, film that is precisely the type of film that deserves to be debated. It vibrates with a sense of vitality that at times makes up for the flaws. This isn’t exactly a masterpiece – I don’t like it quite enough to make that claim – but it’s the kind of interestingly tangled work – at once confidently controlled and dangerously personal – that a filmmaker can sometimes create that will inspire passionate, and justified, feelings both against and in defense. I will defend the film, for despite the genital-centered jokes that appear with inordinate frequency, as is the Apatow standard, this is a subtle and adult work, delving headfirst into tricky themes and remaining mostly unscathed. The film stars Adam Sandler, in an oddly self-reflexive role, as successful comedian George Simmons, who has long since graduated from stand-up to land in the big-bucks studio comedies of precisely the kind in which Sandler has been known to appear. He’s the classic case of a man with everything he ever wanted, yet nothing that truly matters. As the film opens, we follow Simmons as he walks through a public space, stopping to take pictures or sign autographs for adoring fans. We end up with him in an examining room where he is told that he has a rare form of leukemia and only an eight-percent chance of surviving. We then follow him back into the world fully expecting, having been conditioned by countless disease-of-the-week dramas, for Simmons to grow and change, learning life lessons while battling the disease. This doesn’t happen, or at least, not exactly. This is where we meet Ira Wright, a struggling stand-up comedian played by Seth Rogen. He lives with roommates, also comedians, one (Jonah Hill) his colleague in the amateur stand-up world, the other (Jason Schwartzman) relishing his glimmer of success with a mildly successful, if mostly derided, NBC sitcom. It is at the improv where George sees Ira’s act and later calls him and offers him a job as a joke writer. The film then follows George and Ira through an odd relationship, positioned somewhere between personal and professional, with interesting emotional pushes and pulls, naturally arising conflicts with uneasy resolutions. Apatow is unafraid to follow his characters down tangents in plot while in pursuit of emotional truth. In fact, the whole third act of the film could be considered a tangent, dealing with characters who, by that point, have been unseen (Eric Bana) or half-glimpsed (Apatow’s loveably cute daughters) and foregrounding a romance subplot involving Leslie Mann that is arguably unnecessary, but I went with it. The movie is lumpy and misshapen, I won’t argue that point, but it rarely feels like it steps wrong. Even distracting cameos from real-world celebrities are easily ignored in the flow of the feelings the film evokes, in the rich texture of supporting roles like Aubrey Plaza, Aziz Ansari, and RZA who, though given few scenes, create fully realized characters that weave in to the greater tapestry. The film is not about plot. Instead, this is a film about character and emotion, tone and mood. Apatow, working with the great cinematographer Janusz Kaminski, has crafted a movie with understated beauty in the images and rhythm. How often can that be said about a big studio summer comedy? This isn’t just a comedy, but it’s also unfair to label it a dramedy, as some are quick to do. This is a drama, pure and simple. The characters happen to be quick-witted individuals who crack jokes as a default when dealing with any situation. These are funny people, no doubt about it, but they are living the same dramatic lives as any other set of people. Since Apatow started as a stand-up before becoming the success that he is now, it seems that Apatow sees himself in his two leads: Ira is who he was; George is who he all too easily could have become. This is a film, in ways both subtle and sweet, about lives in transition. The arcs the characters travel never feel predetermined, they never creak with convention. Everyone knows by now that comedians are rarely the happiest members of humanity, and Apatow wisely avoids making this the theme of his film. Nor does he merely use the central question of disease and mortality to show us once again how confronting the abyss of death can cause radical change within an individual. With Funny People, Apatow isn’t content to restate. He’s interested in exploring the trickier, subtler terrain where people change in small, not big, ways. In doing so, though this is far from a perfect film, it casts a spell that only messy, tricky, passionately personal films can. The latest example of mind-bogglingly retrograde stereotypes mixed in with mind-numbingly lame comedy is The Ugly Truth, a raunchy romantic comedy with no wit, no style, and no substance. It features Katherine Heigl as a high-strung control-freak career woman harpy with an inability to relate to another human being in a non-business setting. Her foil, and ultimate dispenser of romantic advice, is the crass big-mouthed lout played by Gerard Butler who is hired as a commentator on male-female relationships by the TV station at which she works. They hate each other, but deep down they love each other. Surprised? At least the movie is utterly forgettable, however unbearable. It’s already slipping away from my memory as I type. It's a movie so forgettable, it has been out nearly a month and I kept forgetting it was released. Indifferently shot by dullard director Robert Luketic, The Ugly Truth is all ugly, no truth. It’s a grim, joyless experience, a grueling death-march of a rom-com. The movie plods from one stupid scene to the next, giving me ample time to build my hatred towards it. It offers no real insight into relationships, instead bludgeoning audiences with banalities and filth substituting for substance. Any laughter generated must be purely Pavlovian: “This is a comedy; therefore we must laugh when an actor gives a winking spin to a line.” The movie plays out like a lame PG-13 movie made even lamer by interjecting R-level profanities in an attempt to make the material edgier or more truthful. It's sad and lifeless to watch normally charming actors get dragged through a story like this. Not only is it unknowledgeable about human interactions, but it knows less about the TV business. The movie imagines TV-news as a land with cameras magically ready to capture all kinds of crazy situations and endless airtime on which to run them. Apparently, a technically flawless broadcast can be pulled off with almost no planning and with monologues, comedic diversions, and heartfelt emotional confessions meandering throughout the broadcast. There’s little comprehension of the real mechanics of a live television production, giving the TV-business aspect of the movie slightly less credibility than the shoddy relationships developing between the broadcasts. It’s like Broadcast News with all of its strengths removed. The Ugly Truth is nothing more than the sort of dumb "men are like this; women are like that" shtick that's the stock-in-trade of hack comedians everywhere. From the time she took her first breath, eleven-year-old Anna (Abigail Breslin) has been donating blood, tissues, and organs to her sister’s leukemia fight. Now, with a dangerous transplant operation looming, Anna decides she’s had enough. She hires a hot-shot lawyer (Alec Baldwin) to sue her parents for medical emancipation. This sets the stage for My Sister’s Keeper, an adaptation of the Jodi Picoult novel, it shares its source’s main strengths and its main problem. Both book and film have a great grabber of a concept that plays on the heartstrings but neither have any way of satisfyingly resolving its central moral dilemma. With whom do you side? Is it the young girl who is frustrated at being created for the sole purpose of keeping her sister alive? Is it the exhausted-yet-determined mom (Cameron Diaz) who won’t stop fighting until her sick child is well? This is truly a matter of life and death. It’s not easy to take a side. There are no easy answers, and the movie isn’t interested in answering them, all for the better. The movie gets by on its emotionally resonating performances (Diaz is a standout). As a result, for most of its runtime, the movie is a super-slick Hollywood tear-jerker, a three-hankie salute to disease that is shot through with nearly suffocating sentimentality. This movie is on a mission to make you cry. The only discordant notes are struck with dreary and sappy soundtrack choices, bad songs to go with terrible montages. The courtroom drama aspect of the plot is shoved to the background, the filmmakers choosing to instead focus on the grueling medical procedures and slow-motion decay of its central girl. Young actress Sofia Vassilieva is dolled up in the trappings of a cancer-patient with admirable attention to detail from the make-up department. It’s unflinchingly frank at times. The movie barely starts and we’ve seen our first nosebleed. Vomiting blood, eerie veins under pale translucent skin, and creeping bruises also make appearances. I really should have thought twice before buying the popcorn I ended up barely touching. All the attention to medical detail creates a visceral sense of what the family (we bounce between points of view, which unfortunately means narration replaces subtext) is arguing about, grounding the melodrama in ways a network TV-movie couldn’t. This is not a film that is shy about its topic. And yet, the movie can’t bring its varying threads to a satisfying close. Instead, it goes into emotional overdrive – albeit in a different way than in the novel – yanking on the heartstrings and massaging the tear ducts with such single-minded intensity that it would seem the filmmakers would like your sobbing to cover up the lack of conclusion. (The book and movie differ only in content, not quality). Though there is certainly an endpoint to the plot – something definitively final occurs – there is no emotional resolution. Diaz, especially, is asked to sell some rushed characterization that I just didn’t buy. Director Nick Cassavetes, who previously directed the equally teary The Notebook, knows the time and location of the buttons to press, though. As a disease-of-the-week weeper, My Sister’s Keeper is a mostly acceptable entry. It goes through the motions, and puts it audience through the emotional wringer, even if it doesn’t quite add up in the end. The storyline of G.I. Joe: The Rise of Cobra is so simple a four-year-old child could explain it to you. Lacking a four-year-old child, I will attempt to explain. You see, there are these elite military figures who work together in covert operations. They’re called the G.I. Joes. They’re the good guys. There are also these slimy scientists and weapons developers who are the bad guys. They want to use nanotechnology to, gee, I actually don’t know. Do they want to take over the world, or destroy the Joes, or impersonate the president (played here by Jonathan Pryce)? Maybe that four-year-old would know. When I went to see the movie, I was handed a free starter pack of cards for a collectible card game called “Top Trumps” starring characters from the movie. I have these sitting next to my computer at the moment. Allow me to look at them and try to figure out what exactly is going on in this movie. As it played I could only tell that good people were fighting bad people and somehow that involved interchangeable nonsense names (like Ripcord and Snake-Eyes) and green super-missiles that release tiny metal-eating robots. I sure hope the cards help decode the film and I won’t have to Google my way to a G.I. Joe fan-site. First up is General Hawk. He’s played by Dennis Quaid and I could tell he was the leader of the Joes. According to the card, he’s “infamous and inspirational” and also has “the skills and experience of a battle hardened warrior.” I couldn’t prove this by the evidence in the movie, but Quaid does talk with a commanding voice and often scowls. Next, is something called Neo-Vipers. The card says these are super-soldiers. I remember now that they work for Cobra Commander (or is it just Cobra?) who’s played by Joseph Gordon-Levitt. Every time he came on screen, I would shake my head. What’s he doing? Collecting a paycheck, I suppose. Anyways, these Neo-Vipers are genetically modified. They’re the bad guys because they can’t feel pain or fear. Now I’m looking at a card with a white-clad ninja and it looks like his name is Storm Shadow (Byung-hun Lee). He’s also a bad guy. 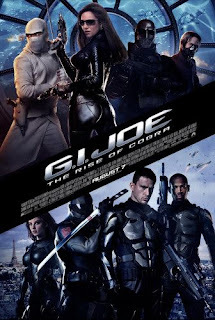 In battle scenes, he’s usually paired up with Snake Eyes (Ray Park), a G.I. Joe who’s a black-clad ninja. Flashbacks tell us that they share a common history when they both – oh who am I kidding? I don’t care. There’s a card for a G.I. Joe with the code name Covergirl. She dies early in the picture. Spoiler, I guess. There’s also a card for James McCullen (Christopher Eccleston), a weapons developer who thinks he’s the main baddie. The movie starts in 1600s Scotland with one of his ancestors getting punished for selling weapons to both sides of a conflict. The card says McCullen wants revenge for this, but to the extent that I do understand the evil plot, I can’t see how it will accomplish that goal. At last we arrive to a card with the main character, a new G.I. Joe recruit who goes by the name Duke. He’s played by Channing Tatum. His best friend and comedic relief is Ripcord (Marlon Wayons). He shares some past with the beautiful villainess played by Sienna Miller. He has a square jaw and, like Quaid, scowls his way through the picture. The card says he’s “the best of the best…or so he thinks.” I’ll take its word for it. As you can see the movie’s fairly confusing, playing out like a bad cartoon, which is exactly what the movie becomes whenever the action sequences start. I’m not talking brilliantly cartoony, like Speed Racer; I’m talking terribly cartoony, the kind of cartoony that throws all logical plot construction out the window for the sake of pure noise and candy-colored blurs. Admittedly, G.I. Joe is a bit better than Transformers 2, but only because it didn’t give me a headache. It’s also marginally better to look at and, if I’m not mistaken, a little more understandable, if only because human beings with actual faces are easier to tell apart than moving junkyards. There’s an equal amount of cliché-chewing hooey to be found, though, from a plane that can only understand Celtic commands to an evil plot so simple yet so confusing (McCullen sells the missiles, then steals them back in order to shoot them at three major cities). At one point the president marvels that no demands have been made. Same here, buddy. There was a time, early in the run time, where I thought the movie would actually turn out to be an agreeably goofy time with the kind of dumb fun that director Stephen Sommers has brought to his previous movies like The Mummy or even, yes, Van Helsing. The promise of a good time is there in a chase sequence through the streets of Paris that manages to be fun despite most of it having appeared in the previews. That one sequence is the only glimpse of the promise to be found amongst so much bland and sterile carbon copies of concepts from better popcorn movies, everything from X-Men to the Star Wars prequels. G.I. Joe isn’t exhilarating, it’s just exasperating. The problem with Julie & Julia is right there in the title. As the movie unspools, splitting its attention nearly equally between Meryl Streep playing Julia Child and Amy Adams playing Julie Powell, a blogger who cooks her way through Child’s cookbook, it’s clear the move is hopelessly unbalanced. Streep is splendid, given a great subject compassionately written. Adams, on the other hand, though not appreciably a lesser talent than Streep, is given less depth and superficial scenes. It’s hard work to make the naturally charming Adams seem whiny and unlikable but it has happened here. Nora Ephron navigates between the two stories with a deft sense of pacing. The look of the film is slickly uninteresting, even the meals, which are attractive without ever becoming sumptuous, but Ephron isn’t a visual stylist. She places the film squarely in the performers and the dialogue she has written for them. Both women have been given half-formed characterizations, as a result of cramming two features into two hours. Amy Adams is a great actress, but this film shows that she may be only as good as the material she’s given. Julie Powell comes across here as thin and shallow, whiny and nagging. When she complains about her job at a call center for those affected by 9/11, it rings false. What would she expect from that job other than complaints and sob stories? If not for Chris Messina as Mr. Powell, the Julie portions would be nearly charmless. Meryl Streep, though, has a way of getting so deep within her characters that we quickly forget that we are watching great acting and find ourselves thinking of only the character. Here she’s carefully shot to appear taller; her voice is a beautifully melodious symphony that starts as an impersonation but ends up as the voice of a fully realized character. Her husband, the always wonderful Stanley Tucci, is an added boost of charm. The Child’s are splendidly in love, experiencing a continuing love affair with each other as well as with food. The love of fun and food is palpable. They’re surrounded by interesting, funny characters as well, creating a warm and rich texture. There are culinary teachers, book editors, Julia’s cookbook collaborators, and a scene-stealing Jane Lynch, as Julia’s sister, who has one of the best character introductions of the year. To see Lynch and Streep, overjoyed to see one another, cavort and carry-on in a train station gave me one of the widest smiles I’ve had at the movies in a while. The Childs’ half of the film is a continual delight interrupted only by returns to the Powells’. The two women’s stories are connected by their writing. Julia’s story follows her game-changing cookbook from genesis to publication. Julie’s story follows her blog project – to cook through all of Child’s recipes in one year – from creation to completion. 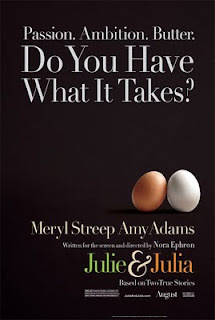 I realize I’m writing these words on a blog but it must be said that comparing Julia’s book to Julie’s blog is nothing but an unfavorable comparison. Julia’s cookbook has the weight of history; its writing feels momentous. Julie’s blog, on the other hand, feels slight and frivolous, nothing more than an outlet for a wannabe writer. She wines her way through her project, complaining every step of the way, with the exception of the times she pauses to say “yum.” As presented in the film, her story is unexciting and uninvolving, though the talents of Adams and Messina make it often casually entertaining, if never able to make us truly care about Powell. It’s never more than a watery TV-movie quality plotline, a pleasantly watchable one with a bad aftertaste. The juxtaposition inherent in the structure enhances the uselessness of Powell’s half. How are we supposed to care about deboning a duck when the Child’s are being investigated by McCarthy? So we have half a fine film, and one of the oddest recommendations I’ve ever written. Sure, the film is undercooked by half, but the half that’s done is well done. Streep gives a great performance in a half-film that’s so well done it made me wish that this was a straightforward Julia Child biopic. But this isn’t Julia, its Julie & Julia. And there’s the problem. But Streep is so contagious in her enthusiastic portrayal the movie is worth seeing without being a must-see. The best moment in Cheri comes late in the film as the camera lingers on a close-up of a woman’s face as the narrator matter-of-factly states that a character’s demise is the direct result of wanting this woman but being unable to get her back. As the statement spills from the narrator’s mouth we stare at the woman, this sad beauty who stares out at us. Then the shot continues, lingering a moment longer than expected. It’s devastating, or rather, nearly so. To be truly devastating, the film would have had to work harder to be less of a frothy bauble, or at least more fun. The film stars Michelle Pfeiffer as an aging courtesan in early 1900s France who finds herself falling in love with Cheri (Rupert Friend), a much younger man. They have an affair that is complicated only by the fact that Pfeiffer is friends with Cheri’s mother (Kathy Bates) who wishes to marry her son off to the daughter of another high society member. The movie titters and gossips along with these, and other, wealthy ladies, flitting from one scandal to another, ruminating on love lives and dishing all the dirt. This is an exquisite froth that never truly delights, a romance that never truly swoons, and a drama that stays too surface to move. As a soap-operatic melodrama, Cheri never kicks up enough heat. The characters are superficially developed, leaving the audience out of the affair. There’s never a sense that the characters care about each other. Cheri, and all those around him, remain blank canvases. For all the light, delightful moments from Pfeiffer and Bates, there’s a never a real sense of what makes these people behave the ways they do, other than vague nods towards the societal context. The film is well mounted, handsomely shot by Stephen Frears, who has made great films in the past (most recently The Queen and High Fidelity) and will hopefully make them again in the future, but this film is nothing more than pretty, vacant, people moving through pretty landscapes and architecture, which brings me back to the narrator (Stephen Frears), who observes and comments on it all. Most of the important events in the film, both internal and external, are either redundantly narrated or narrated without being shown at all. He’s (apologies to Mr. Frears, who’s voice is certainly pleasant) a total detriment, only adding to the sense of forced frivolity, the sense of watching someone else play with dolls while we strain over his shoulder to watch and understand.